Writer's words: I was standing at the exit of the Mériadeck rink in Bordeaux, where Trophée Eric Bompard, the French leg of the Grand Prix, was being held. It was about 11 a.m. on Nov. 23, 2014, and Adam Rippon was leaving the ice after a morning practice session. I will probably never know how Adam made it through that interview, but afterward he hugged me very dearly (a move we, the French, are by no means used to). It took place at a turning point in his career: He had hit bottom a few months before, missing out on qualifying for the Sochi Olympics. There he was, starting all over again, not even knowing how long he would keep going. During the interview, he said, "Being in the spotlight one day and nowhere the next is kind of a difficult pill to swallow, for sure. You feel that you are still going at the same pace, but at the same time…where are you going? You feel like…lost, in the middle of nowhere. For a while, I was the best next thing. I was a junior world champion twice. Then I grew up. Skating was changing tremendously at the same time; there was lots of pressure, I moved back from Canada to the U.S. When I look back at that time, I see that you do not know how to deal with such pressure when you are 20 years old." From that point on, Adam's career took off. Figure skating is harsh in forgiving: Going upward is certainly much easier the first time than the second. Once you've fallen, it takes loads of effort to come back again. Adam did that, and in the most beautiful way possible. I wish during that meeting I could have opened a window into the future so he could see what a huge success he would become, particularly in these last few months. Adam Rippon is a role model for anyone who feels like his or her career is going nowhere. Keep loving, he taught us all, and maybe -- maybe -- it will happen. Writer's words: I started writing for icenetwork with Drew Meekins in 2008, as more or less a gossip columnist. The majority of our pieces were posted under the heading "The Inside Edge," and they focused on funny, weird or interesting stories, with a few celebrities sprinkled in and frequent references to fashion. With Drew, and eventually on my own, I reported on engagements, weddings and babies. I always enjoyed having relaxed, casual conversations with skaters about things that had nothing much to do with skating. Sometimes, though, I had very serious conversations with skaters. They told me about the frustrations and pain of injuries, the heartbreak of failure, the sadness of breaking up with a partner. In 2016, I found myself wondering what it's like for successful skaters after they retire from competition and leave skating behind. I suspected that it might be quite difficult to navigate the years following retirement without the one thing that had played such an important role in these peoples' lives. The stories I heard were personal and moving, and I did my best to convey what it's like for someone to embark into the great unknown. Writer's words: While I've written mainly features for icenetwork, it is a competition story that stands out for me: My article on Meagan Duhamel and Eric Radford winning their first Canadian title in 2012. Nothing can rival the sheer joy and pride they felt in finally achieving a lifelong goal that both had thought they'd probably never reach. After they skated their final competitive performances at this year's Olympic Winter Games, I thanked them for letting me come along for the ride these last six years. While I felt very emotional seeing photos of them receiving their gold and bronze medals in PyeongChang, nothing rivals that January night six years ago when both were so raw and open with me. One of the best skating stories I've ever told in a long career of covering this sport. Writer's words: For years, I had listened to skaters talk about their having received ballet instruction, only to find out after further inquiry that for most of them that meant taking the occasional class. So I filed a mental note when Nathan Chen mentioned to me in 2016 that he had taken ballet lessons regularly for a number of years. Hoping to find a fresh angle for a story about the sport's new sensation, I decided to look into Chen's ballet background. A Google search turned up newspaper stories about his having actually danced in productions as a boy. That was enough of a lead to follow, so I called several people who taught him (and danced with him) at Ballet West Academy in Salt Lake City. One after another, the people to whom I spoke raved about Nathan's innate ability as a dancer and explained his particular physical and intellectual gifts for the discipline. All agreed that, if his emphasis were reversed, he had a chance to be as good a dancer as he was a skater. The most illuminating piece of my research came from looking at old photographs of Rudolf Nureyev dancing Le Corsaire, the basis of Chen's 2016-17 short program. Chen told me he and choreographer Marina Zoueva had closely studied the Nureyev interpretation, and you could clearly see parallels between the skater's leg and arm positions and those of the legendary dancer, who also had been a groundbreaker in his discipline. Never did the story suggest Chen would have been a Nureyev had he chosen dance over skating. My goal simply was to write in more depth about a facet of Chen's background that previously had been given only cursory mention. If the piece (accompanied by videoof the 12-year-old Chen in The Nutcracker) challenged some of the closed-minded shibboleths about Chen and/or encouraged people to learn more about Nureyev, so much the better. Writer's words: During my annual trek through North American training centers, I met with Tessa and Scott in Canton, Michigan, in July 2013. While at practice, I heard and recognized the pieces they were skating to, and asked them if I could file a report about it. They told me they were not ready to reveal their program music yet, and asked me to keep it a secret until two or three days before their first public performance, which was to be at the Quebec Summer Championships. I convinced them it was in their best interest to let icenetwork publish the music as early as possible to ensure nobody else used it -- and they agreed. Writer's words: In this interview with Alissa Czisny, the former two-time U.S. champion came off as more sincere, more open-minded, more thoughtful and, let's say, freer than any other athlete I've ever talked to. Writer's words: I'm choosing two because they're close to my heart: Eric Radford and Adam Rippon's coming out stories in 2015. They had come out separately and prior to my writing these respective articles, but I loved getting the chance to share their stories and hear how they arrived at their brave conclusions. It was such an honor to get to write about Eric as the "Person of the Year" in 2015. After the story about Adam, I remember thinking to myself how proud I was of these fellow queer men not shying away from being themselves in the public eye. That's what real champions do -- always stay true to themselves. 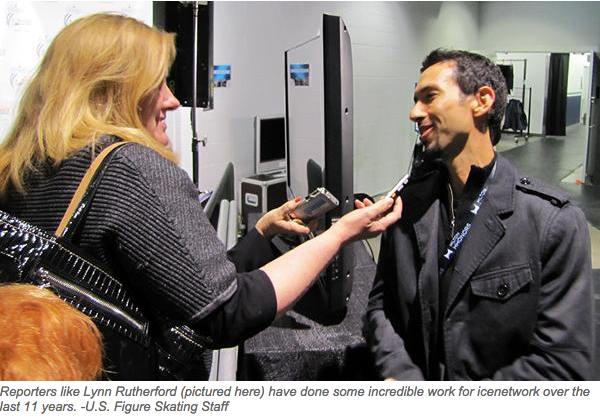 Writer's words: I have been fortunate enough over the years to interview many of the top skaters in the world, but one of the most memorable interviews, for me, came from a woman named Savannah Lavenstein. A longtime competitive skater, Savannah bravely opened up to me about her battles with concussions for a piece I wrote in Fabruary 2016. At the time, concussions in skating was a topic that wasn't talked about very much, but with her willingness to share her story in such a frank and honest way, Savannah allowed readers to put a face and a name to this very important issue. I'd like to think this piece made skaters, parents and coaches more aware of the perils of concussions in a sport in which the inherent physical dangers aren't widely reported. Writer's words: I knew figure skating was hugely popular in Japan, but until I reached out to dozens of Japanese fans, I didn't realize how much it truly meant to many of them. Two-time Olympic champion Yuzuru Hanyu, in particular, goes far beyond matinee idol status; to a sizable number of supporters, he touches all kinds of inspirational chords. Not to be overlooked is the monetary benefit of the Japanese fans' unflagging devotion to the sport, which translates to a healthy amount of much-needed revenue.